The French mathematician and inventor Jean-Baptiste Laurent de Hillerin de La Touche de Boistissandeau was born on 24 (baptized on 26) July, 1704, in Paris, the first child in the noble family of Jean-Baptiste de Hillerin de Boistissandeau (13.09.1664-14.05.1732), conseiller au Parlement de Bretagne et du Roi, and Marie-Catherine Moreau de Villiers (b. about 1680). The family had also a daughter—Marie-Catherine Armande (1709-1740). The young Hillerin de Boistissandeau was an energetic and passionate about the study of science. Growing in the family Castle of Boistissandeau from the late 16th century (see the lower image of Château du Boistissandeau), in the vicinity of the town Les Herbiers, western France, he made many developments around the castle and in particular the construction of vast elevated greenhouses and granaries and rooms to house the domestic staff. He was interested in physics and mathematics, and later in instrument making. Besides his calculating machine, he is known as an inventor of various instruments, including a regulateur de parquet (it is a clock, used as reference to those around him, so that everyone is at the same time) in 1732, a surveyor in 1744, a portable barometer in 1758, etc. Hillerin de Boistissandeau was a Counselor of the Parliament of Bretagne and was appointed advisor to the Board of Auditors of Paris by 1744. Chevalier Hillerin de Boistissandeau was also a Gentilhomme ordianire de la chambre du Roi and membre correspondant de l'Académie Royale des Sciences (section of physics and mathematics) in Paris. 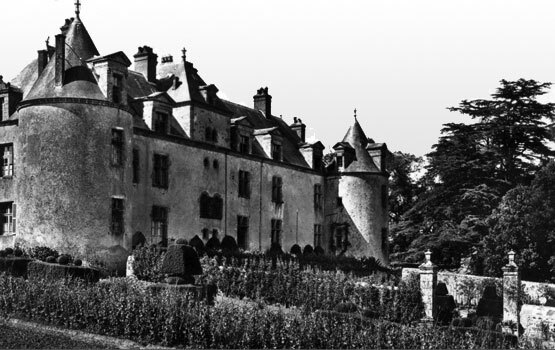 He was a friend of the great french scientist René Antoine Ferchault de Réaumur, who made frequent visits to the Castle of Boistissandeau and even had a reserved room on the first floor of the castle, equipped as a small laboratory. Hillerin de Boistissandeau married to Marie Agathe Bourpet de Beuvron (1711-1794) on 17th of August 1735 in Paris. The pair will have 8 children—6 daughters and 2 sons (Marie Catherine (1736-1794), Antoinette Henriette (1737-1794), Louis François (1738-1799), Marie Agathe (1740-1794), Catherine (1742-1774), Julie (1744-1790), Louise Adélaïde (1750-1790) and Armande (1752-1820). Seigneur de Boistissandeau died on 15th of February 1779, in the Castle of Boistissandeau. His widow, Marie Agathe was killed by hussars-republicans in the Castle of Boistissandeau during the massacres of French Revolution on 31th of January, 1794, together with her daughters Antoinette Henriette, Marie Catherine and Marie Agathe.